St. Andrew's Rectory, constructed in 1903. St. Luke Episcopal Church, located on Wolcott Avenue, nurtured the development of St. Andrew Episcopal Church (read more here about St. Luke Episcopal Church's history). In 1870, the rector of St. Luke Church, the Rev. Henry E. Duncan, oversaw the formation of a Sunday School that met under the direction of George A. Seaman above the First National Bank. In 1875, the Sunday School moved from the bank building to what became known as the DeWint Street chapel. Nineteen years later, a carriage house with property was purchased for $3,500 on South Avenue. The first worship service on South Avenue was held in the carriage house that became a chapel on December 2, 1894. The mission work at the DeWint Street chapel and at the South Avenue carriage house chapel was overseen by the rectors of St. Luke's Church. The DeWint Street chapel is now a private home. The South Avenue carriage house chapel is now the Carriage House hall of our church. After consent was obtained from the Episcopal Diocese of New York, St. Andrews Church received its charter from the State of New York in the spring of 1899. The first wardens elected to serve St. Andrew's Church were James M. DeGarmo, Ph.D. and George H. Williams, M.D. James M. DeGarmo ran the DeGarmo Institute on Rombout Avenue to provide classical education for local and boarding students. A graduate of the Yale School of Medicine, George H. Williams was the head physician in charge of Highland Hospital, Beacon’s first hospital, which began in 1871 as a two-story frame house on Russell Avenue. Ralph S. Tompkins was the first clerk of the vestry of St. Andrew’s Church. Ralph was born in 1876 to Lewis, a prominent Fishkill businessman. The first treasurer of St. Andrew’s Church was John F. Van Tine, the superintendent of the local branch of the Corliss Engine Company, a firm established by the American inventor George Henry Corliss that revolutionized the design and construction of steam engines. The Rev. Joseph P. Cameron was called as the first rector of St. Andrew's Church. He began his service to the parish on September 21, the Feast of Saint Matthew the Apostle and Evangelist, in 1899. Born in Bermuda in 1854, Cameron graduated from the General Theological Seminary in 1876. He was ordained a priest the following year by the Rt. Rev. Dr. Gregory Thurston Bedell, Third Bishop of the Episcopal Diocese of Ohio. Cameron stayed at St. Andrew’s parish until 1905. He died while serving as rector of St. Luke’s Church in Lanesborough, Massachusetts in 1916. The building of St. Andrew’s rectory was made possible through John P. Rider's generous offer to lend the parish $5,000 to cover the cost of its construction. For several years, the interest on the rectory’s mortgage was paid by Benjamin Hammond’s wife Laura. Benjamin Hammond was one of the U.S. pioneers in the manufacture of insecticides. Hammond’s Paint & Slug Shot Works was a successful business on Beacon’s Long Dock. Benjamin was a deacon and elder of the Reformed Dutch Church. Laura, an Episcopalian, was the daughter of Richard Kip Anthony and Ann Bowie Dash, in whose memory St. Andrew's ambo was donated. In 1911, John P. Rider paid off the mortgage on St. Andrew's rectory, which he presented as a gift in memory of his deceased daughter Jeanne De Forest Montgomery. She was the mother of the actor Robert Montgomery who attended Sunday School at St. Andrew and lived across the street in the brick house on the corner of Beacon St. and South Avenue. On May 25, 1900, the cornerstone was laid for St. Andrew’s Chuch addition by the Rt. Rev. Henry Codman Potter, the seventh bishop of the Episcopal Diocese of New York. Charles B. Van Slyke was selected as the architect of St. Andrew’s Church. Van Slyke also designed Fishkill Elementary School, which was built in 1910 to replace an older school that had been completely destroyed by fire the previous year. The new Sanctuary of St. Andrew's Church was opened for its first worship service on the Feast of the Epiphany, January 6, 1901. St. Andrew’s Church features three picture and 18 ornamental windows created by Louis Comfort Tiffany, the American designer recognized internationally as one of the greatest forces of the Art Nouveau style who made important contributions to the art of glass-making. The Rev. George A. Green, St. Andrew Church's second rector. The Rev. Cameron was succeeded in 1905 by the Rev. George A. Green, St. Andrew's second rector. Green was born in Oswego in 1871. Before attending the General Theological Seminary, he earned a Bachelor of Arts degree and a Master of Arts degree from St. Stephen’s College, which changed its name to Bard College in 1934. Green stayed at St. Andrew’s parish until 1915. From 1919 to 1927, he was director of the social service department of the Seamen’s Church Institute. Thereafter, he served until 1939 in the chapel at Sailors’ Snug Harbor, a home for aged seamen opened on Staten Island opened in 1833. The Rev. Charles P. Holbrook served as the third rector of St. Andrew’s Church from 1915 to 1917. Holbrook studied at the Boston University School of Theology before being ordained a priest in 1911 by the Rt. Rev. Robert Atkinson Gibson served, Sixth Bishop of the Episcopal Diocese of Virginia. In 1920, Holbrook helped organize and build the Episcopal Church of the Advent, which began as a mission church of Old Christ Church in Norfolk, Virginia. He died in 1933 while serving as priest-in-charge of the Episcopal Church of the Resurrection in Greenwood, South Carolina. From 1917 to 1920, the Rev. William H. Wheeler served as the fourth rector of St. Andrew’s Church. Wheeler was born in Little Falls in 1879. In 1902, he earned a Bachelor of Arts degree from Trinity College in Hartford, Connecticut, which was founded by the Rt. Rev. Thomas Church Brownell, Presiding Bishop of the Episcopal Church from 1852 until his death in 1865. Wheeler attended the Church Divinity School of the Pacific and was ordained a priest in 1905 by the Rt. Rev. William Ford Nichols, Second Episcopal Bishop of California. From 1922 to 1952, Wheeler ministered at the Thompson Orphanage and Training Institution that was established by the Episcopal priest Edwin Augustus Osborne in Charlotte, North Carolina in 1887. Wheeler died in 1964. The fifth rector of St. Andrew’s Church, the Rev. Gerald H. Lewis, served our parish from 1920 until 1925. Lewis was born in Coal Valley, West Virginia in 1880. Lewis attended the Newark Academy, a college preparatory school founded in 1774 by the Presbyterian minister Alexander MacWhartor. Lewis was a very controversial figure at St. Andrew’s Church, which was a “low church,” tending to minimize emphasis on the priesthood, sacraments, and ceremonial in worship. Priests at St. Andrew’s were referred to as “Mister,” but that changed when “Father” Lewis arrived. Under his leadership, St Andrew’s Sunday morning service was an Anglo-Catholic Mass. Lewis introduced the use of incense, the reserved sacrament, and a sanctuary lamp. After the installation of a rood screen and a confessional, the vestry sent a delegation to Bishop William T. Manning demanding he remove Lewis from the parish because many communicants were absenting themselves from the services with a consequent withdrawal of their financial support. Lewis moved on to serve parishes in the Midwest. Today, St. Andrew's Church has neither a rood screen nor a confessional. In 1926 and 1927, the Rev. James B. Sill attended to St. Andrew’s Church. The New York-born Sill spent most of his adult life serving parishes in North Carolina. The Rev. John L. Villalonga became rector of St. Andrew's Church in 1928. Villalonga transferred into the Diocese of New York from the Missionary District of Puerto Rico. Born in 1874, he died of pneumonia in 1930. From 1930 to 1946, the Rev. Eugene F. Bigler was rector of St. Andrew’s Church. Born and raised in Ohio, Bigler graduated from Kenyon College in 1900. Bigler was independently wealthy and lived in Beacon on Church Street, instead of living in St. Andrew's rectory. While in Beacon, Bigler also worked as chaplain of Castle Point Veterans Administration Hospital. Bigler served St. Andrew's Church during the Great Depression, when the parish neighborhood changed markedly. The New York Rubber Company along with other companies closed down and the neighborhood became predominately Italian. Bigler died in 1958 and is buried in St. Luke’s cemetery. On December 12, 1948, St. Andrew’s Church was consecrated by the Rt. Rev. Charles K. Gilbert, Eleventh Episcopal Bishop of New York. The last indebtedness of the parish was paid off through an anonymous gift in 1948, making it possible for the bishop to consecrate our building. The clergy, wardens, and vestry members of the parish extended to the community a cordial invitation to be present on this important occasion and to join the congregation in praising God. The Rev. Robert J. Creech was vicar of St. Andrew’s Church at the time of the consecration. Creech served the parish from 1947 to 1951. He lived in the rectory and saw the congregation grow. However, new parishioners were commuting in from the surrounding area, rather than walking in from the parish neighborhood. From 1953 to 1959, the Rev. E. Otis Charles was priest-in-charge of St. Andrew's Church. The parish neighborhood became increasingly African-American in the 1950s. Charles made a concerted effort to invite people living near the church to worship. Consequently, our congregation became more racially and ethnically diverse. Charles went on to serve as bishop of Utah from 1971 to 1986. In 1985, Charles became dean and president of the Episcopal Divinity School in Cambridge, Massachusetts. Upon his retirement in 1993, Charles publicly announced his homosexuality, becoming the first openly gay bishop of any Christian denomination. The Rev. Gerald W. Humphrey served as St. Andrew's priest-in-charge from 1959 to 1962. After graduating with a Bachelor of Arts degree from the University of Chicago in 1955, Humphrey studied at the Church Divinity School of the Pacific in Berkeley, California. Prior to his college studies, Humphrey served 45 months in the U.S. Army, including service in the Korean War. He was awarded the Purple Heart for wounds suffered in action. In 1958, Humphrey was ordained a priest by the Rt. Rev. Horace W. B. Donegan, the Episcopal Bishop of New York from 1950 until 1972. 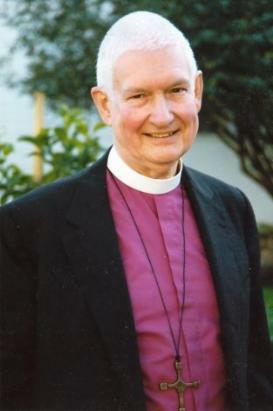 Before retiring from parish ministry, Humphrey served as the Assistant to the Archdeacon of Switzerland from 1978 to 1985. The Swiss Archdeaconry is part of the Church of England's Diocese in Europe. The Rev. William K. Martini was priest-in-charge of St. Andrew’s Church from 1962 to 1964. Martini grew up in Winslow, Arizona and attended Arizona State University. He interrupted his education to enlist in the U.S. Army, in which he was stationed at Fort McClellan, Alabama. Martini achieved the rank of sergeant before being discharged in 1954. Two years later, he graduated from Arizona State University with a Bachelor of Arts degree. In 1958, Martini received at Bachelor of Sacred Theology degree from the Episcopal Theology School in Cambridge, Massachusetts. That same year, Martini was ordained to the priesthood. The following year, he married Mary Margaret Melick. Their daughter Anna became an associate professor of geology at Amherst College. After leaving St. Andrew’s Church, Martini served for 33 years with the Rev. Joseph M. Elliott at St. Paul's Episcopal Church in the Bronx. He died at the age of 74 in 2004. The Rev. Thomas A. Moneymaker was installed as priest-in-charge of St. Andrew's Church in 1965. The son of an Arlington, Virginia doctor, Moneymaker attended the Capitol Page School in Washington, D.C. After earning a Bachelor of Arts degree from Duke University, Moneymaker, then a Methodist, studied at the Theological School of Drew University in Madison, New Jersey. He then attended the Episcopal Theological School in Cambridge, Massachusetts. "As priest-in-charge you will work under the Rules of The Department of Missions and will be directly responsible to me. I am especially concerned that there be a genuine working arrangement with Father Mitchell at St. Luke's, and that cooperation be on more than a token basis, to the end that a greater degree of mutual responsibility occurs. I would suggest that there not only be Sunday exchange from time to time, but also that in released time education and in other aspects of program, you work with Father Mitchell. It may be that you could assist St. Luke's in some parish calling. I am sure that you and Father Mitchell will be able to effect a cooperative approach. I recognize that the long years of separation will not be easy to overcome, but I am sure that by working together the two parishes will make positive steps in that direction, and this is what we hope to see happen." - The Rt. Rev. Horace W. B. Donegan to the Rev. Thomas Moneymaker, 14 April 1965. Under The Rev. Moneymaker's leadership, St. Andrew's diverse congregation took a leading role in improving race relations in Beacon. In 1968, Moneymaker encouraged the formation of the Martin Luther King Cultural Center, which served the community until its closing in 2011. The Rev. Moneymaker died in tragic and difficult circumstances in 1998 and the parish struggled for many years to cope with this tragedy. A number of priests were appointed as Priest-in-Charge between 1998 and 2014 which included the Rev. Jean Campbell, the Rev. Claire Woodley, the Rev. Cn. F. Anthony Cayless, the Rev. Samuel Reddimalla, the Rev. Frank Alagna, and the Rev. Dr. David M. Carletta. In 2014 The Rev. John F. Williams was appointed as Vicar of St. Andrew's and remains as the Rector of St. Andrew and St. Luke Episcopal Church after the merger of St. Andrew's and St. Luke's churches in 2018.